Conventional methods for protein expression rely on bacteria, yeast, plant, or mammalian cell lines. Many proteins, however, cannot be manufactured in these systems, including those with novel chemical modifications such as non-natural amino acids. Sutro Biopharma says its open cell-free synthesis (OCFS) method rapidly makes proteins that cannot be produced by conventional systems. The OCFS technology acts more like a biochemical system than living cells, so conditions can be exploited to make proteins of interest. “It’s ‘open’ in the sense that different reagents can be added in a combinatorial fashion to find the right conditions for optimal protein synthesis,” says William J. Newell, CEO. James Swartz, Sc.D., created the OCFS technology at Stanford University. 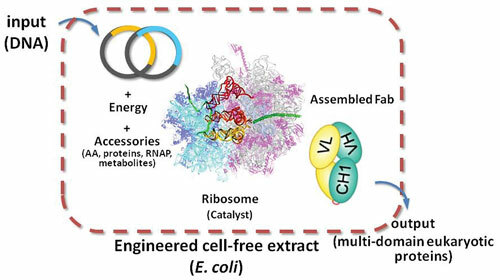 Swartz removed the ribosomal machinery needed for protein transcription and translation from Escherichia coli and then transformed the key components into a cost-effective platform for protein manufacturing. The ribosomal machinery is contained in a cell-free extract that can be modified to carry out reactions under conditions that living cells cannot tolerate. Swartz helped start Sutro Biopharma in 2003, based on the intellectual property that he developed surrounding the E. coli cell extract and its modifications. The cell-free expression system can produce peptides, cytokines, antibodies, and other proteins in either small laboratory batches or larger quantities. “The cell-free extract is the same regardless of the peptide or protein that will be synthesized. That’s a fundamental difference that distinguishes our method from other cellular expression systems,” says Newell. Among the challenges Swartz faced was how to fuel large-scale protein production. For small laboratory research, ATP fuels the ribosomal machinery, but the amount of ATP required for large-scale protein synthesis is cost prohibitive. Swartz solved the problem by using cheaper energy sources to activate oxidative phosphorylation pathways, which, in turn, generate ATP for the ribosomal machinery. “This is a fundamental part of the IP that we licensed exclusively from Stanford,” says Newell. OCFS was designed to promote proper folding by optimizing synthesis and the chemical and physical environment to maintain homeostasis throughout the expression process. The components of the system were selected to closely mimic the environment of the cellular folding compartment. In addition, the open architecture of the system allows additions of exogenous chemical species as well as catalysts to promote folding in the cases where those additions are needed. A major advantage of Sutro’s platform is that non-natural amino acids can be introduced to produce novel protein therapeutics for scientific exploration. Other systems that incorporate non-natural amino acids involve orthogonal tRNA cell-based methods and extensive protein engineering, and they take months to years to perfect. In contrast, Sutro’s OCFS technology allows non-natural amino acids to be added directly in a highly predictable way, and proteins are rapidly generated in a days or weeks, Newell explains. New versions of peptides and proteins, which are more specific or potent than natural ones, can be made through the incorporation of non-natural amino acids. Rather than being restricted to the 20 natural amino acids, focused libraries of non-natural amino acids expand Sutro’s toolkit. “In our process it takes five to six hours to make and screen variants with non-natural amino acids,” says Newell. The platform combines rationale combinatorial chemistry with protein engineering, an approach similar to that used for screening small molecule drugs. In just days, “you can identify a lead candidate, use small combinatorial libraries to iterate around the lead, explore the space, and quickly winnow down candidates and keep the best ones,” Newell says. The trick to working with non-natural amino acids is finding ways to insert them into an exact location within a protein structure in order to generate a homogenous, reproducible protein product. Researchers at Sutro Biopharma developed analytical methods to ensure that non-natural amino acids are conjugated at exact sites and remain intact during scale-up, important features for both protein manufacturing and regulatory control. Sutro Biopharma collaborates with other companies to design peptides and proteins. In 2010, the firm also began using its platform to pursue therapeutic opportunities in-house. Its first major collaboration was initiated in January 2011 with Pfizer for undisclosed targets. The partnership gives Pfizer access to peptides that are difficult to produce with conventional technologies. As projects progress to clinical-stage development, Sutro can provide initial quantities of cGMP product from its new cGMP facility that is scheduled to open early in 2012. Sutro likely will supply partners with its cell-free extract for protein manufacturing, which can be used by any contract manufacturing facility. “There’s nothing magical about the manufacturing setup if you have the ingredients and know the process,” says Newell. A recent study in the July 2011 issue of Biotechnology and Bioengineering showed that Sutro’s OCFS technology platform produces high yields of synthesized proteins with straightforward downstream purification processes. In the study, the bioactive cytokine human granulocyte-macrophage colony-stimulating factor was produced at linearly scalable levels of up to 700 mg/liter in 10 hours. Since publication, batch efficiency has doubled, says Newell, demonstrating the potential of the company’s OCFS technology for cGMP manufacturing. Other companies sell cell-free protein expression kits, but they sustain only tiny amounts of protein, Newell notes. The advantages of Sutro’s system include its scalability to commercial size batches, use of low-cost energy sources, and ability to incorporate non-natural amino acids. “Our system gives people an opportunity to explore a wider space in a faster timeframe in the protein research and manufacturing space,” says Newell.